Some photos from The Tower of the Americas in San Antonio, TX today! 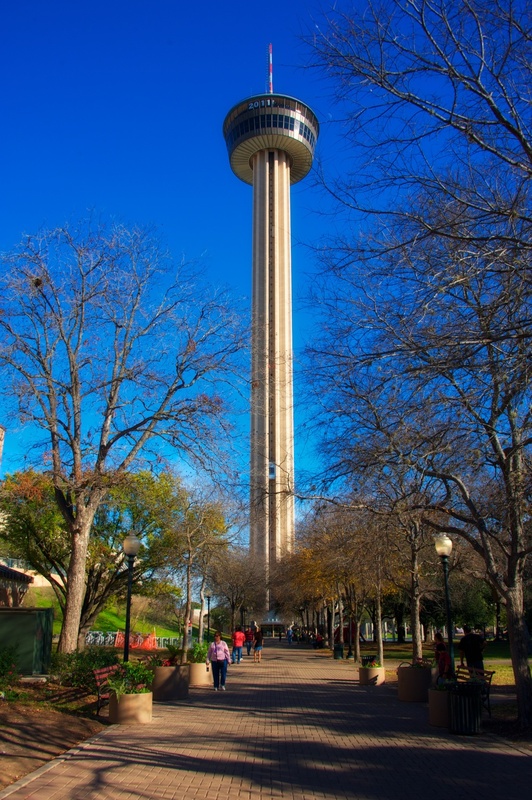 On New Year's Eve day, we drove down to San Antonio, TX for lunch with some of the family at the Tower of the Americas. If you aren't familiar with the Tower, it is 750 feet tall and has a rotating restaurant at the top, giving you commanding views in every direction. Plus, the food is good. I had not been there in a really long time, and sadly did not bring all my normal photo gear, just opting only for the 28-300 lens and no tripod. When we walked up to it and I found all these incredible fountains, I was click happy but regretted the lack of my wide angle lens and tripod. I did fire off brackets, but ended up just using a single exposure for this one. I loved the late afternoon light hitting the water, and of course all the little streams of water cascading this way and that. Heck, while I am at it - here's a shot of the Tower of Americas in San Antonio. As I said, it's 750 feet tall, so I had to back up pretty good to get this shot! Like I said at the beginning of this post, it was New Year's Eve day so if you look close enough you can see the 2011 at the top of the Tower. I'm guessing at midnight they were changing that over to 2012!